(C) The most severe form of fluent aphasia in which the patient is completely mute…. Global aphasia. (D) A semantic change in which the meaning of a word becomes more positive or favourable…. Pejoration. (A) Prepare language teaching materials for the mentally challenged. (B) Determine the areas in which learners may need help. (D) Evaluate the proficiency of learners at the end of course. (D) Neither a genetic nor an acquired disorder. 6. Assertion I: Internal reconstruction takes into consideration the data of a single language. Assertion II: Internal reconstruction attempts to posit an earlier stage of the language. (D) The speakers did not like the variety of Martha’s Vineyard. 14. Assertion I: In Greenberg’s universals there is repeated reference to the ordering of subject (S) object (O) and verb (V) in the precondition of the universal. Assertion II: This striking fact led W.P. Lehmann to propose that the relative ordering of verbs and objects was in some sense basic to language structure. (A) I is correct, but II is wrong. (C) Both Assertion I and II are correct. 20. Assertion I: When the subject of an infinitive clause is null, it is called a PRO. Assertion II: A PRO is the subject of a non-finite sentence without any phonetic realization. (B) Only I is true. (C) Only II is true. 23. Assertion I: Missing Surface Inflectional hypothesis states that second language learners who produce errors actually have correct underlying representations for the structure in which they have made errors but have difficulty mapping these underlying representations to their surface forms. Assertion II: Missing surface inflection hypothesis states that second language learners who produce errors are due to blind spots found in second language. (A) Both I and II are right. 25. Assertion I: Advertisements also use sound patterning to make the slogan memorable and this is simply in extension of the way poetry uses sound patterning to particular effect. 27. Hypothesis (H): If a word in its underlying representation contains some morpheme M, then at least one segment of M must be present in the Result surface representation. (A) It is neutral to the phonological environment. 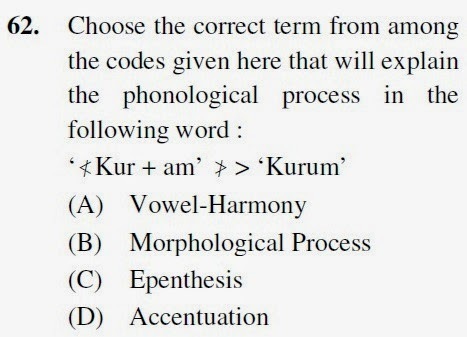 (B) It is non-neutral to the phonological environment. (C) It is phonologically conditioned. (D) It is historically conditioned. 33. Who among the following is the author of the research paper “The Pronouns of Power and Solidarity”? 34. Assertion I: Variable rule analysis is the method of analyzing sociolinguistic data in which statistical procedures allow a variety of social and linguistic factors to be considered simultaneously. Assertion II: Variable rule analysis is the method of analyzing linguistic data that allow inferring the socio-linguistic mechanism of linguistic change. 35. Assertion I: Basilect shows the greatest difference from the source language. Assertion II: Mesolect and acrolect are intermediate and highest part of the creole continuum respectively. (B) I is false and II is true. 38. Assertion I: Pronoun replacement, repetition, variation and ellipsis are all cohesive devices. Assertion II: They work by repeated reference to something within the text. 39. Assertion I: Translation studies are usually seen as a discipline that explores the nature of cross language communication. 41. Assertion I: Modern lexicography considers dictionaries to be tools that are or should be conceived to assist a specific group of users in solving problems related to specific type of extra lexicographic user situation. Assertion II: Any theory based dictionary concept should therefore be based on a profound knowledge of the user’s characteristics, the situation of use and the specific type of problems that might arise. (C) I is correct but II is wrong. (D) I is wrong but II is correct. (a) Source oriented translation (i) Keeping the target readership uppermost in mind. 44. Assertion I: Derivational Morphemes increase the vocabulary of a language. Assertion II: Derivational Morphemes are usually added to closed classes of words. 51. Assertion I: The assumption that movement is a composite operation involving two sub operations of copying and deletion is the cornerstone of Chomsky’s copy theory of movement’. Assertion II: If we consider the copying component of movement more carefully, we see that it involves a form of ‘merger’ operation by which a copy of a constituent which has already been merged in one position is subsequently merged in another position. 52. Assertion I: Machine Readable Dictionaries (MRD) evolved from keyboarding a dictionary onto punch cards. Assertion II: The ground breaking work of Evens (Evens and Smith 1978) provided the impetus for a considerable expansion of research on MRDs. 54. Assertion I: The loss of ability to produce speech with a normal intonation is known as dysprosody. Assertion II: A use of language that emphasises pleasantness is named as dysphemism. 58. Assertion I: If one can efficiently calculate the prefix probability, then calculating probabilities is straight forward. Assertion II: A shift-reduce parser provides the means to calculating conditional probabilities in the ‘Structured Language Mode’. 60. Match the items in List - I with List - II. 61. Assertion I: Prosodic word cannot exceed two feet in any natural language. 63. Grammatical difficulties which have been noticed in aphasia are given in the list. Identify which one item related to paragrammatism and agrammatism. (A) Loss of coordinating and subordinating syntactic. (B) Loss of speech melody as an indicator of segmentation. (C) Loss of comprehension of grammatical words and inflections. (D) Use of incomplete sentences or the mixing of grammatically incompatible sequences. 66. Assertion I: Sense relations are relations between word meanings. Assertion II: Every word has a semantic relation of some kind with every other word, but not all such relations have any intrinsic interest. (C) Will have the value ‘false’ if the speaker understands Hindi. (D) Will not have the value ‘false’ if the speaker understands Hindi. 69. Assertion I: Many languages have very rich aspectual markings modifying the meaning of the base verb in very subtle ways. Assertion II: It is very common for a given inflectional morpheme to signal a complex mixture of tense, aspect, mood and polarity. 72. Match appropriately the concepts given in List – I to the inferences given in List – II. (b) Duallanguage, programme (ii) Education programme for language minority students in which minority and majority language is used but literacy in minority language is not a goal. 73. Match appropriately the concepts given in List – I to their respective inferences given in List – II. (iii) Marker (c) The overgeneralization of language forms which carry social prestige.